Britannia is more fun with miniatures. This page describes the resources needed to play the Avalon Hill Britannia board game with miniatures in true scale. True scale means that the miniature figures are the same scale as the board and any other items in the game. Several scales for the game are discussed. Britannia is a medium complexity war game, somewhat more complicated than a typical family strategy game, but with great historical flavor. After a few plays one gets a good understanding of the combatants, the motivations, and the alternatives for the inhabitants of the British Isles during this period. More information on the game is available at Board Game Geek or the Britannia Home Page. For years now I been upgrading my Britannia game with more substantial pieces. I am improving the cardboard counters with miniatures, replacing each counter with a stand of four 15 mm lead figures from the Old Glory ancients line. Additionally, I am replacing the game board with a full color British Ordnance Survey map of Ancient Britain (ISBN 031929028X) approximately 6 feet by 4 feet (190 cm by 127 cm) (available from Stanford's). This map has a faint image of modern Britain underlying markers for burial mounds, dykes, hill forts, cairns, broches, and other ancient features. While painting I wondered how close a 15 mm figure and a 2.5 square meter map are to true scale. I pulled out the Encyclopaedia Britannica and a calculator and started calculating. A 180 cm (5' 10") person is 120 times the size of a 15 mm figure. In order to use a proper size map, one must find a playing surface that is 1/120th the actual size of the British Isles. Since the British Isles are 245,000 sq. km (94,600 sq. mi.) or approximately 550 km (335 mi.) tall by 969 km (591 mi.) wide, one must divide these figures by 120 to get a truly scale map. I figure 4.6 km (2.8 mi.) by 8.1 km (4.9 mi.) is about enough for a properly sized map. This is just 37 sq. km (12.8 sq. mi.) or about 8,800 acres. A map of this scale would give you a good feel for what it takes to march an ancient an army to battle. I figure the plains near Fargo, North Dakota or Winnipeg, Canada would be an ideal site for the board. Depending on the lay of the land, we could use Jeeps or quadra-track cycles to find and move our pieces around the board. We would also need some room around the edges for our chairs and snacks. For those looking to economize, perhaps smaller figures could be used. One scale that comes to mind is 1000 to 1. This scale requires 1.8 mm figures - about 1000 of them equal in height to a 180 cm (5' 10") person. At this scale, the mainland of Britain could be represented on a 550 m (0.335 mi.) by 969 m (0.591 mi.) surface. This is only about 0.53 sq. km (0.20 sq. mi.) or just 130 acres. Your average Lotto winner could afford this land with ease. (In fact, I hope to do it once I win.) Additionally, this size land could be purchased closer to home and not require fellow players to fly to Fargo. Mountain bicycles or even walking would be ideal for moving pieces around the board. At this scale, the average human towers a scale 1800 meters (1.1 mi.) above the pieces, somewhat akin to a mile high airplane flying over the battle field. Those armies look like ants down there. A nearby radio tower could support a web cam or camera to allow participants to view the entire board at once. For those that like the size of the British Ordnance Survey map (approximately 190 cm by 127 cm (6 feet by 4 feet)), one can always scale the metal figures down to meet the map size. This map is about 1/625,000 of the size of Great Britain. Thus, one can scale down a 180 cm human to 0.003 mm size. I do not know of any figure manufacturers that have Ancient figures in 3 micrometer size. This scale has the advantage of requiring very little paint to paint an entire army. One must be careful, though. At this scale 10 of these figures can fit on a pixel printed at 250 dots per cm (600 dots per inch)! 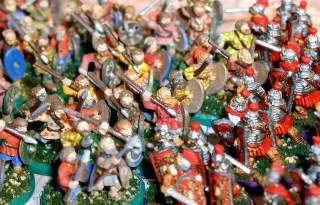 I hope you've enjoyed this exploration of developing a truly scale miniature game of Britannia . Many of the unit conversions were made at the Online Conversion web site. If you see any errors in the calculations or have any other comments, please write. Updated (2002/09/16) - Richard Huzzey from St. Anne's in Oxford U.K. notes "I enjoyed your discussion of scale-modelling your Britannia game, but think you missed a very obvious solution. Why not pop over to the UK one month and play the game real-scale? We may need a few helpers to move the pieces for us, but I think Madame Tussauds could help with the six-foot (or shorter- as ancient peoples were shorter than we are) models." Count me in Richard! Last modified: Thursday, 09-Jun-2011 12:37:37 MST.